This time of year it seems that there is a holiday mixer nearly every night of the week. And don’t get me started on the “Let’s catch up over an eggnog latte” invites I’ve started to see in my inboxes lately. How can we turn this merry making into career enhancement? Use it to grow our professional network. Amidst this hustle and bustle, there are many ways to make a difference. During the last month of the year, practically everybody wants to socialize and spread some cheer. Join in the fun and nurture your network. When you make time to attend and participate in any holiday event, I recommend using LinkedIn to do your follow-up and stay connected to the new folks you meet. Here is a common example. If you meet a job seeker and offer to make an introduction to one of your contacts in recruiting at Oracle, why not make the connection or introduction within LinkedIn? 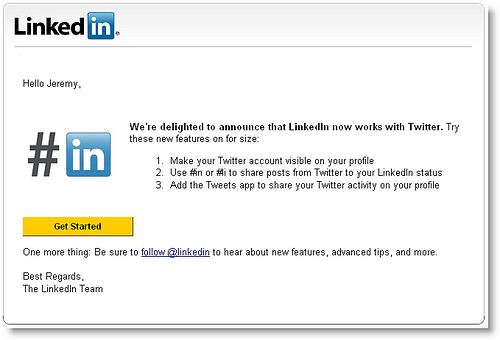 Of course, it’s easiest to do this if you’re LinkedIn to both parties, but you don’t have to be. If you’re not sure whether you want to link to the new person yourself just yet, but know that the recruiter would want to (don’t they all? ), you can just send their public profile link (for example, mine is http://www.linkedin.com/in/sandyjk) to your recruiter contact via an email or use the “Share” button within LinkedIn to forward the job seeker’s profile to them. I typically share the recruiter’s information with the new contact, but recommend that they wait for my intro before contacting them. As most of us know, a warm intro is always better than a cold call, especially to someone who is already bombarded with calls or emails. I also frequently use LinkedIn as my follow-up tool when I’ve met someone with whom I’d like to stay connected. I likely now have their email address, thanks to the business card they gave me at the event, and I can send a LinkedIn invite using it. One major caveat though is that you absolutely, positively need to write a personalized note in the invitation to connect. This means you have to go to their profile page first and then scan the right side of the page for the yellow “Connect” box and check off which type of connection might apply (colleague, classmate, friend, etc.). Be ready to supply the email address you have, if necessary, and edit the canned message in the personal note box on the screen. Trust me, you’ll differentiate yourself from the masses if you personalize your message. Most people don’t, for some reason. By doing so, you’re more likely to create some good social capital, as well as get your invitation accepted. I rarely accept an “Invitation to Connect” unless the person sending it has taken the 10 seconds to write a brief note or at least remind me of how we met. Gwen, I really enjoyed hearing about your career goals for 2012 and, if I can be of any assistance to you in the New Year, please don’t hesitate to reach out. Let’s stay connected via LinkedIn and I hope you have a happy holiday season. Lastly, think about all those people you’d like to acknowledge or thank for their support throughout the year. Write a recommendation. Besides sending a hand-written thank you note or Christmas card, why not consider writing a LinkedIn recommendation for them? It costs nothing and has immeasurable value now and for years to come. Send a congratulations note. Use LinkedIn to look up your contacts and see if they’ve been up to anything new and then offer congratulations or ask them about their year or plans for the future. Discover new networks. Lastly, don’t forget, you can now also use LinkedIn to find brand new events to attend. Depending on how big your town is, and how often you sign up for emails or “Like” the Facebook page of groups for which you’re a fan, you may want to seek out additional opportunities via the recently enhanced “Events” feature on LinkedIn. Consider attending something you’ve never attended before and see if you don’t find a few great new people to add to you network and with whom you can share some holiday cheer. Happy holidays all!